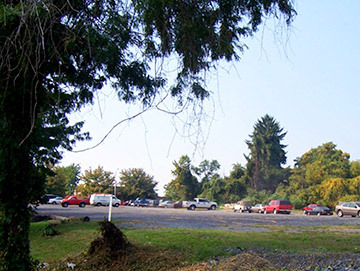 Hanover Engineering was retained by Northampton County to assist in converting a temporary, gravel overflow parking area into a permanent, paved 125-space public parking lot. The site is located at the corner of Union and Washington Streets in the City of Easton, near the Northampton County Courthouse. The lot provides highly-needed additional parking for the courthouse and surrounding area. Services provided by Hanover Engineering include design of the site improvements and preparation of the lot consolidation and land development plans. Site improvements for the new facility included curbing, lighting, an underground stormwater detention facility, and landscaping. Design considerations for the site focused on obtaining the maximum number of parking spaces that could be provided at the site. In addition, since the use of the parking lot is important to accommodate the parking needs of the area, the County requested that the facility be reconstructed and reopened within 30 days – a goal that was successfully accomplished. The new paved parking lot provides a more maintainable and uniformly lit facility. The aesthetics of the area was enhanced by the planting of additional trees in and around the lot, and stormwater management was greatly improved through the installation of additional catch basins, storm pipe, and an underground detention basin within the lot. Accessibility also has been improved along Union and Lehigh Streets through the construction of Americans with Disabilities Act (ADA) compliant curb ramps and crossovers.